The world once again was taken to the brink of World War 3 Monday night, and the situation is still extremely dangerous. A massive wide-ranging assault on multiple Syrian provinces, including the coastal cities of Latakia and Tartus, occurred Monday evening reportedly by Israel and possibly with the help of France or the US, though the Pentagon is denying any US assistance during the assault. With Syrian and Russian air defenses responding during the over hour-long attack which targeted among other things an alleged chemical weapons research center, and in the confusion of missiles cross the sky, a Russian maritime patrol plane was shot down with 14 personnel on board. The Pentagon is claiming it was Syrian defense which "accidentally" downed the plane, while Russia is pointing out its radar observed a French frigate firing in the area just before the plane went down. Regardless, this is an incredibly dangerous situation which puts world powers closer to major war. And crucially, the whole event came immediately after Russia and Turkey announced they've agreed to establish a "demilitarized zone" around Idlib. Before talks in Sochi on September 17, via AP. The Russian Ministry of Defense (MoD) announced just hours before the reported Israeli attack was initiated that Russia and Turkey have agreed to establish a 15-20km demilitarized zone along Syrian government positions. This means the widely reported Syrian-Russian offensive is off for the time being, according to the Russian MoD. But this raises the following questions given the timing of Monday's night's escalation: with Putin negotiating for a 'world power deescalation' over Idlib after the US threatened attack, was Monday's attack part of an Israeli (and Western allies) strategy for keeping regime change in Damascus on the table? Why escalate now? This at the very least appears a conscious effort to keep the fires burning in Syria, to prevent Putin from being in the driver's seat, and to continue to provoke hostilities with the Tehran-Damascus axis, and to further keep alive the possibility of the eventual military ouster of Assad. After Monday's meeting with President Erdogan in Sochi, Putin related to reporters the details of the Russia-Turkey-Syria demilitarization deal: "At the meeting, we discussed in detail this situation (in the Idlib governorate) and decided to establish a 15-20km-wide demilitarized zone along the contact line between government troops and the armed opposition by October 15, 2018 and evacuate radical militants, including Jabhat al-Nusra," he said. 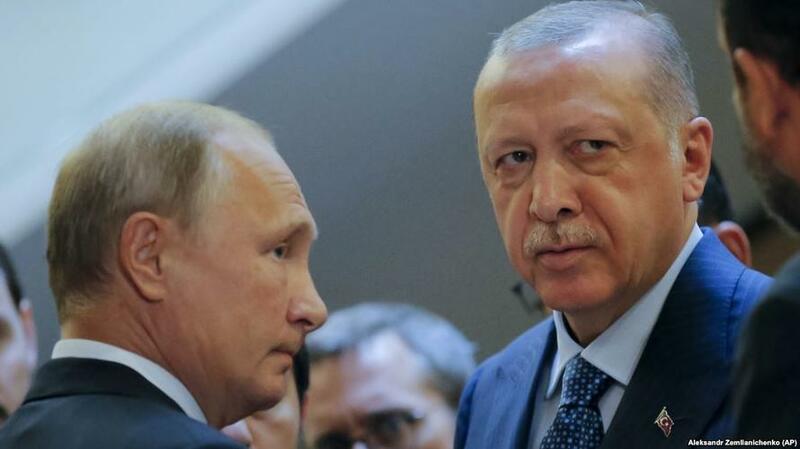 Putin explained that at the Turkish president’s initiative, there will be a planned "withdrawal from this zone heavy weapons, tanks, multiple missile launcher systems, artillery systems and mortars of all opposition groups" by October 10". "Control in the demilitarized zone will be exercised by mobile patrol groups of Turkish units and units of Russian military police," Putin said. He added that the sides agreed to "resume transit traffic along the Aleppo-Latakia and Aleppo-Hama highways by the end of 2018, also at the initiative of the Turkish side." "Russia and Turkey are working closely to resolve the Syrian crisis, to strengthen the ceasefire and improve the humanitarian situation," Putin said. Putin further said the deal involves Syria agreeing to "coordinated solutions," but that the details of the deal are still being worked out with Damascus. "In general, the Syrian leadership supports this approach," he said. "We will hold additional consultations with the Syrian authorities soon." "Russia and Turkey reiterated their commitment to continue anti-terrorism efforts in Syria in any of its forms or manifestations," Putin stressed. "We agreed that practical implementation of the steps we plan will give a fresh impetus to the process of political settlement of the Syrian conflict and will make it possible to invigorate efforts in the Geneva format and will help restore peace in Syria." Putin also emphasized that the sides will work together to root out terrorists across Syria. But given Monday night's massive escalation, it doesn't appear Israel or its Western allies want to see to this deal take effect.